I originally came up with this design because I wanted a really big candleholder. I didn’t want solid panels, but wanted little gaps between the glass to create an interesting effect as the candlelight reflected off the different types and colours of glass. 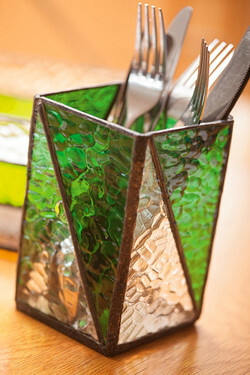 The design is versatile and can be put to various uses – mine holds wooden spoons in the kitchen. 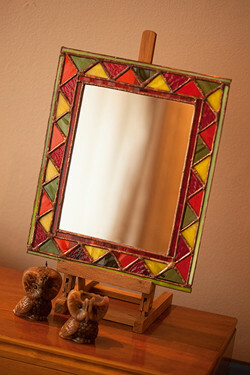 We wanted to create something traditional, African and very brightly coloured. The emphasis here is on the border. We decided to make a small mirror that would be displayed on an easel. 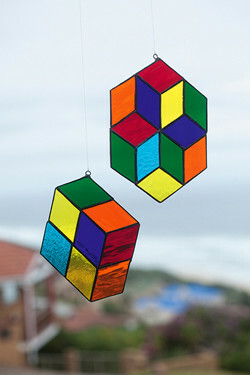 You need brightly coloured glass that allows a lot of light through. 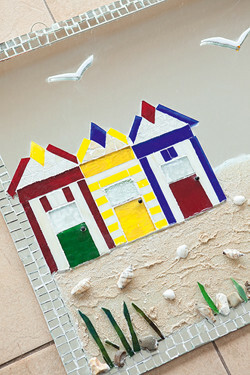 This idea was inspired by the beach cabins that Gail saw in Poole in the UK while she was visiting there. 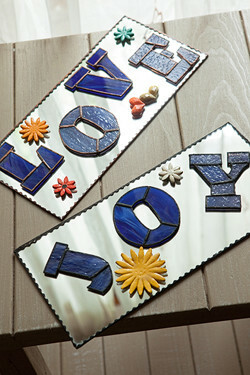 This is a wonderful and different way to add a creative finishing touch to your bedroom, kiddies’ room or guest room. Gail and Henry came up with this stunning variation on a classic black-and-white theme. It is really effective as the border to a mirror. We decided to combine the methods for these two lamps as they are identical. It is simply the pattern on the shades that is different. 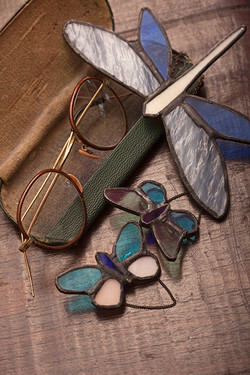 As we’ve mentioned before, we never throw out glass offcuts, unless they are really small slivers. 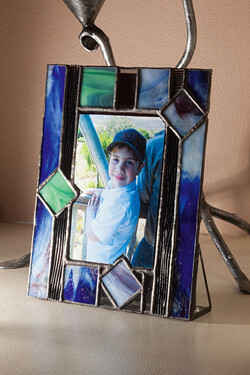 This is a wonderful way to use up some of your leftover bits of glass. So, get out your tubs of offcuts and create something a little different. 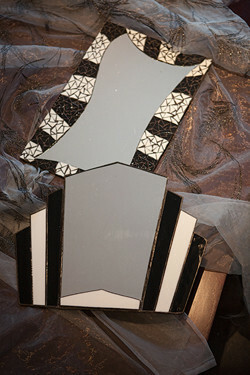 There is no pattern for this project, as we used the pieces as they were left over from previous projects. This is a really useful and attractive piece to have in your kitchen, for storing cutlery or wooden spoons and spatulas. 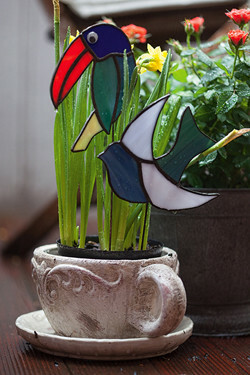 You could even use it as a vase, providing it passes the watertight test! We have them in our kitchens and we love them. 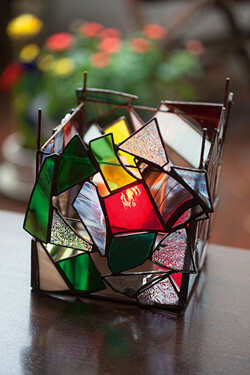 This is a impressive but simple project as you also need to cut eight identical pieces of glass, join them up, then cut a base and solder it to the bottom. We made an octagonal bowl to achieve a bigger size. 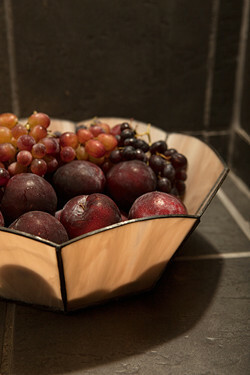 If you want to make a hexagonal bowl you need a hexagonal base and six sides. Have fun playing around with colour: you can make a bowl all from one colour, alternate colours using two different colours, or cut each panel from a totally different colour using different types of glass … whatever appeals to you. We based the toucan on a pattern that we found on the Screaming Eagle Stained Glass Studio website . We added a brazing rod post to the birds so that they can be pushed into the soil in a pot plant or garden. We used simple patterns with not too many pieces as we did not want our birds to be too cumbersome and heavy. Gail and I both wear specs and hate having that cord hanging around our necks. So we love this fabulous solution that Gail came up with, to resolve the problem of what to do with your specs when you’re not wearing them but you need them close at hand. 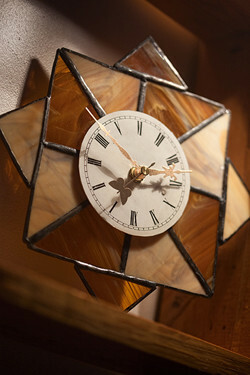 Gail created the basic pattern for this clock a while ago and used it to make up a number of glass items, none of them clocks. Then she tweaked the pattern a bit and came up with this simple and stunning clock, which is an ideal way to use up glass offcuts. Now you know why we are always telling you to hang onto the offcuts from other projects … there is always something you can do with them. This wonderfully versatile Spectrum Glass Pattern of the Month (“Waiting for the Bus” by Linda Pinto, Northeast Stained Glass, Newton, NJ) is a great way to spruce up a kids’ room or bathroom. You can either solder rings onto it, making each little person into a sun catcher, or you can appliqué them individually to a mirror. 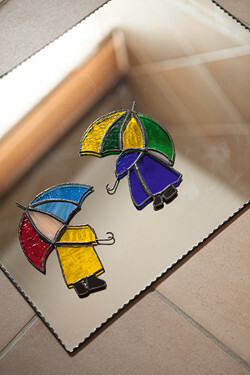 We just love the cute raincoats and boots. 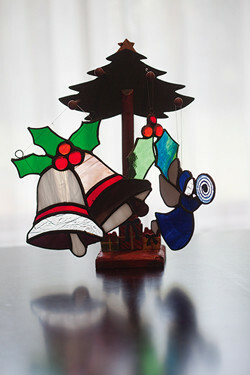 This versatile mobile can be finished off any way you like. 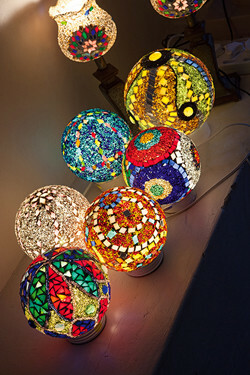 It is beautiful when reflecting the light, so make advantage of this when hanging it. The top is strengthened by means fo two lengths of brazing rod soldered diagonally into the corners and the central shape is suspended from a jump ring where the rods cross. 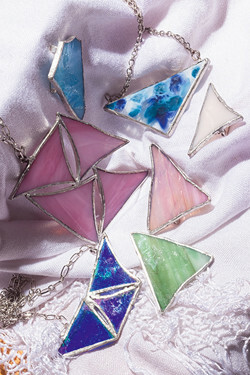 This sun catcher is made up of a series of diamond shapes, all cut the same size from transparent glass, which allows a lot of light through it. It will be a talking point next time you have visitors. 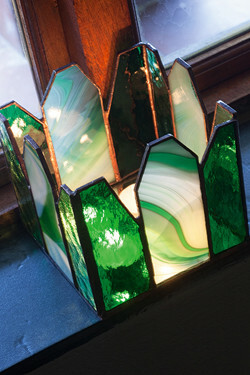 This is a fabulous way to use up offcuts of glass that are left over from other projects. 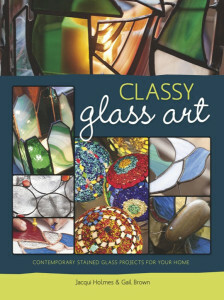 It works really well if you use a variety of colours and types of stained glass: a wonderful effect is created when light shines through different finishes of the various types of stained glass. 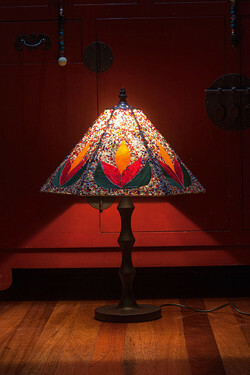 This is a four-panel lamp, which you can either attach to a lamp stand or hang from the ceiling. We thought it would be useful to show you how to make a frame with a stand that you can use to display a family photograph on your mantelpiece. 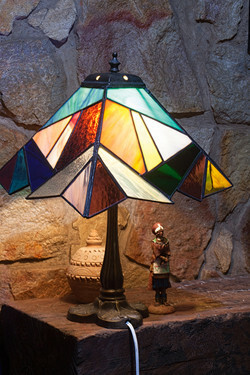 Gail came up with the idea for these lampshades while she was overseas. She experimented with the design and, after some trial and error, we finally found the winning formula. They have proved to be extremely popular. 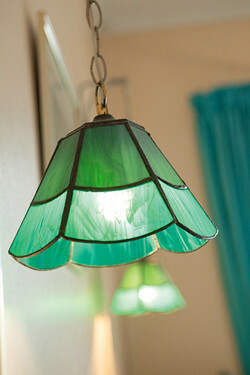 They are a great way to liven up old, boring light fittings and use up glass offcuts. You are unlikely to create two that are identical no matter how hard you try, so each one is unique. Even if we plan the pattern before we begin, this normally changes as we go along. This is part of the fun. We love this clock because there are so many variations that you can use for the numbers, and different ways to finish it off or create an interesting look. 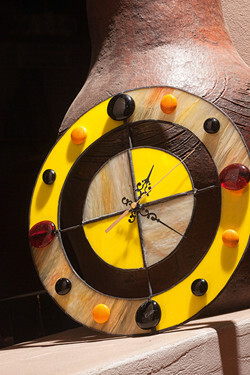 You can make this clock up using two different colours, the same colour in different shades or several different colours. Most of us have seen words created in one art medium or another – wood, wire, mosaics and so on … we decided to create words in stained glass. We used the patterns for the words from a book I have, called Decorative Alphabets Stained Glass Pattern Book by Ed Sibbett Jr., and the assembling and finishing off is my own creation. This is an idea that Gail’s friends Joyce and the late Johan Liebenberg came up with years ago, and she has given her permission for us to include it in our book. 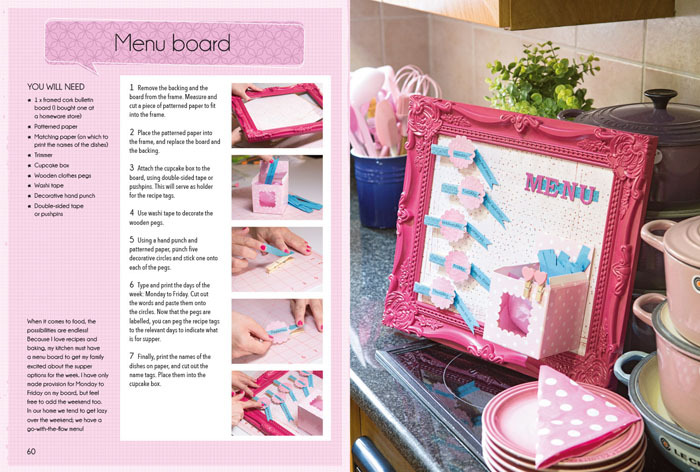 It is a very practical and pretty box to create, either for yourself or as a gift. 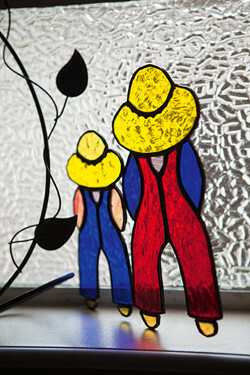 This Spectrum Glass Pattern of the Month (“Day’s Done” by Elizabeth O’Neil, The Glass Managerie, Leominster, MA) is great as it’s versatile. 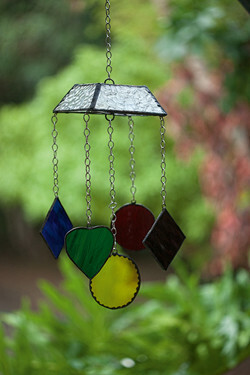 You can solder rings onto it to make a sun catcher, or you can appliqué it to a mirror in a child’s room or bathroom. We just loved the dungarees and hat. This is a lovely candleholder for your dining-room table or the mantelpiece. 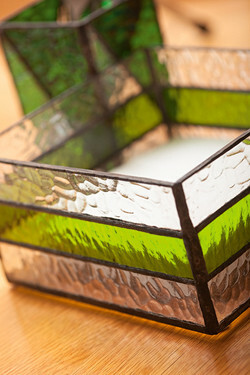 We have used greens, which create a beautiful effect when you place a candle in it. Light brings glass to life. A mirror base is wonderful to use in a candleholder, as it reflects the light and the effect is even lovelier than with a glass base.